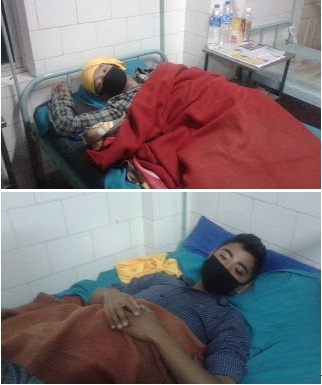 Mukesh Sharma: Two member of Khambu Rai Samaj who sat on indefinite hunger strike at Trikone Park has been admitted at Kalimpong hospital after their health deteriorated . The hunger strike which started from 16th entered the 4th day today in which two Sahadev Rai and Christopher Rai who refused treatment in morning time was admitted to Kalimpong Hospital this evening after having low BP and Pulse rate.Meanwhile the number of Striker have raised from 14 to 22 after 2 joined from yesterday and 6 joined from today informed Sandip Kulung secretary of Khambu Rights Movement(KRM) . The indefinite hunger strike at Trikone Park. Samaj was started against the interference of Kirati Khambu Rai Sanskritik Sansthan(KKKRS) in Development board announced last month by CM. The Khambu Rights Movement(KRM) which was spearheading the movement for ST status along with Development board got happy news on 24th Jan when State CM Mamata Banerjee announced the formation of Limbu and Rai Development Board. A meeting was called on Saturday by DM Darjeeling to both KRM and KKKRS at siliguri but to no avail. Binesh Khambu KRM coordinator warned that if any up and down happens to hunger striker the KKKRS will be solely responsible.